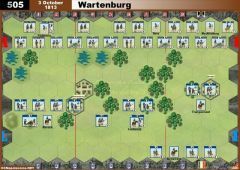 The battle of Lützen was not a set piece affair. 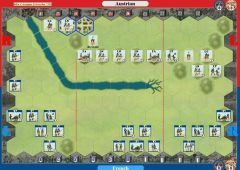 It began as the allied Army of Silesia began concentrating to the south, on the right flank, of Napoleon's Army of the Main which was marching from Lützen towards Leipzig. 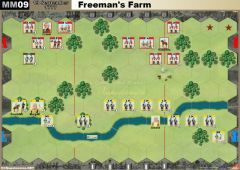 The center of the battlefield focused on a cluster of four villages, and Ney's mostly conscript forces barely held on. The villages exchanged hands several times, and Napoleon himself led the collapsing French at one point, at great personal risk. 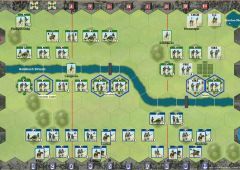 His presence reinvigorated the inexperienced French and bought enough time in the center to allow approaching reinforcements to set up a double-envelopment. The struggle in the center took its toll, creating carnage described as resembling "a bivouac where whole battalions had lain down." The leadership suffered mortalities, and even Ney and Blücher left with injuries. A Grand Battery under Drouot was established on the ridge between Kaja and Starsiedel and pounded the allies near Rahna. 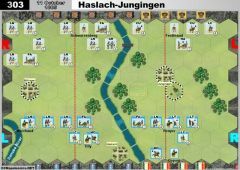 At 6 :00PM, Napoleon ordered the final charge in the center to beat nightfall starting with the Young Guard kicking the remaining Prussian forces from Kaja. The remains of Ney's III corps, Imperial Guard and Guard Cavalry. 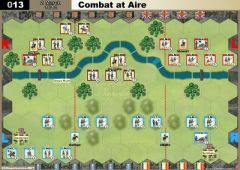 along with Bonnet’s forces from Starsiedel advanced and pushed the allies from the villages as the French artillery advanced and battered the retreating army. 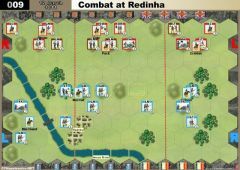 Though a victory for France, lack of good french cavalry made the pursuit inadequate and the allies would escape. 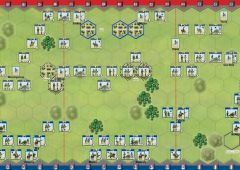 Mother Russia rule is in effect but ignore Saber and Cavalry results. 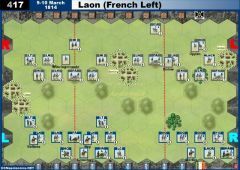 French LN units are conscripts but receive the melee bonus if stacked with or adjacent to a leader. 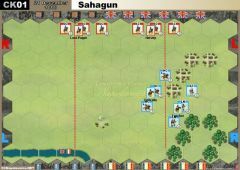 Time pressure objective rules work against the french. See epic rulebook for details. Red hexes are a temporary majority group objective worth 1 banner. 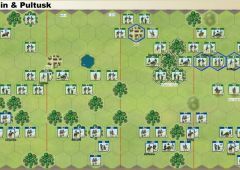 Green hexes are a temporary majority group objective (turn start) worth 2 banners for allies, 1 for France. Grey hexes are temporary objectives (turn start) worth 1 banner each for the Allies. Rahna is worth 1 for France. Allies start with 6 victory banners for held objectives. 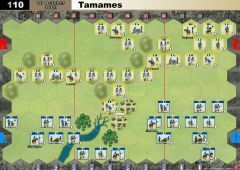 Two huge defeats for myself against my old comrade Guillaume aka Leboucher aka The Butcher of Borodino. This is a fine scenario that has gone through much development. Alternate setup if you do not like scenarios beginning engaged would be to pull leftmost FR LN unit back one and move the YG with Dumoistier back to that now open slot and then to move the other YG back one so it is adjacent to the FA and forest. The scenario was played and seems fine as published, but I know some people miht prefer the forces not be adjacent at start.